I said somewhere in a recent post that 2010 will be a battle ground for climate change. Climate change deniers are popping up everywhere harping on about climate change being an hysterical pseudo-religion, dangerous alarmism, indoctrination or bunkum. You can read about 10 top climate change deniers and their arguments here. In Australia, we have Tony Abbott, the leader of the Opposition (Liberal Party), who is probably our most vocal climate change skeptic. His very scientific consideration of whether or not our planet is heating up is: “climate change is crap“. Don’t know about you but I’d rather our leaders were more measured in their evaluation of the most serious global crisis we currently face. I’d rather they listen to the climate change scientists (who surely have the expertise to assess what’s going on) and if there is a remote possibility that climate change is happening, act collectively with other countries to do what can be done. But seems the battle is heating up (so to speak) because a recent poll revealed a steep decline in Americans’ belief in global warming. 57% of Americans think there is solid evidence the world is getting warmer, down from 77% in 2006. The problem is that scientists aren’t great at communications and working with the media. It’s difficult to communicate complex scientific ideas to the general public. The climate change deniers on the other hand are good at propaganda. If you look at the Top 10 deniers, most of them are politicians, journalists, people with degrees in areas other than science, lobbyists or people who have a hand in the back pockets of oil companies. So it’s somewhat easier for the deniers to win the propaganda war. The analysis suggests that average global temperatures have increased by about 0.8°C (1.5°F) since 1880. Rising levels of carbon dioxide are not the only factors. Changes in the Sun’s irradiance, oscillations of sea surface temperature in the tropics and changes in aerosol levels can also cause slight increases or decreases in the planet’s temperature. Temperatures tend to decrease when La Niña is around, which is what has been happening recently in Europe with the icy weather. But the El Niño phenomenon takes over and scientists are predicting that 2010 could be the warmest year on record. Here in Australia since about November, Adelaide, Perth, Melbourne and Sydney have experienced temperatures around 40℃ (104 ºF) if not higher and hot weather conditions have been declared “catastrophic fire alerts”. Maybe I’m getting to be a really old goat but I don’t recall growing up with such extreme weather conditions. We even have 40℃ days followed by a dramatic drop in temperature so the next day might be 26℃ (78.8 ºF). The analysis also points out that volcanic eruptions have not counteracted global warming during 2009. Volcanoes spew forth sulfate aerosols that reflect incoming solar radiation back into space and this helps to moderate global temperatures. If you want to read more pointy-headed scientific stuff, check out this interview with a climatologist, discussing surface temperature record. And you should also read the US National Oceanic and Atmospheric Administration global analysis. 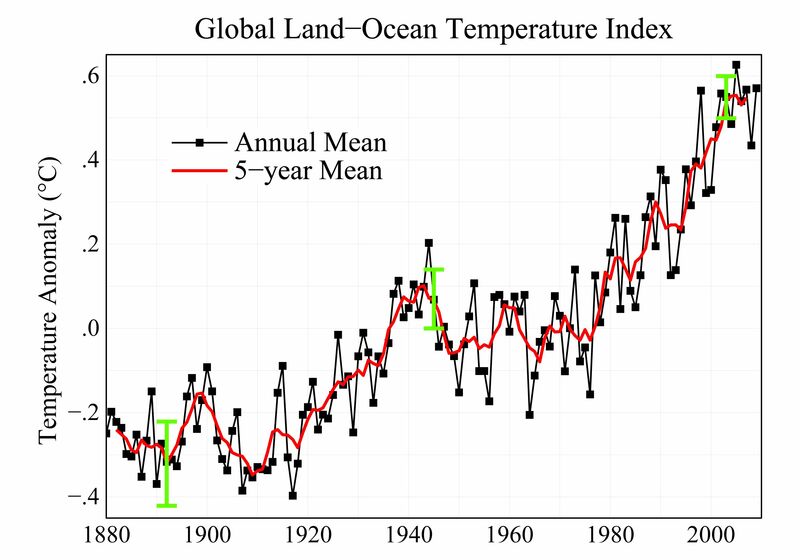 The NOAA concluded that global land and ocean temperatures for 2009 tied with 2006 as the fifth warmest year on record. NOAA puts the year at 0.56°C above the 20th century average. The NOAA have produced a chart showing global significant weather and climate events for 2009. Alaska had its second warmest July on record. Australia had record-breaking heatwaves (ah yeah, I felt them). China suffered its worst drought in five decades. East Africa: drought led to massive food shortages affecting 23 million people. So Tony – you might just want to check out some of the serious scientific stuff before you declare climate change to be crap. Entry filed under: Climate Change, global warming, NASA, Useful resources. Hi Roger Can you leave a link to your blog for my readers (and me) to check out? There is indeed an “info glut” – what to believe from the minefield of information about GW? And if it’s happening, are we too late to do anything? that is the BIG question. Roger, you’re from NZ? I’m moving there very soon as I believe that Australia will burn up with GW. I’ll check out your blog. You are welcome, but make sure you bring plenty of untaxable cash because the way the economy has been run here its difficult to get ahead. Not just moaning either by the way, I was in the same economics class at uni as our current prime minister and it appears that political expediency overules what he learnt about economics. Of course, if you want to come as a beneficiary you will do as well as most. It is no lie that NZ is 10-15 years behind Australia in most ways including economic.